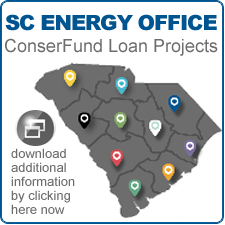 ConserFund is a revolving loan program administered by the Energy Office for energy-efficiency improvements in state agencies, public colleges or universities, school districts, local governments, and 501 (c)(3) organizations. The loan program is focused on supporting the implementation of energy-efficient improvements that provide long-term cost reductions and energy savings. Because these loans are possible because of public funds designed to reduce energy, projected energy savings must be documented. Therefore, any work begun before the application has a signed loan document will not be covered by the loan. Annual interest rate is a fixed rate set below the Wall Street Journal prime rate (currently 1.5%; rate is evaluated June 30 of each year). Loans may cover up to 100% of eligible project costs. Borrowers may finance projects from $25,000 up to $500,000 per state fiscal year. For government borrowers, the first payment is not due for one year after construction is completed and payments will be made annually thereafter. For 501(c)(3) borrowers, the first payment is not due until the first quarter after construction is complete, and loan payments will be made quarterly thereafter. Please download and save application to your computer BEFORE entering any data.